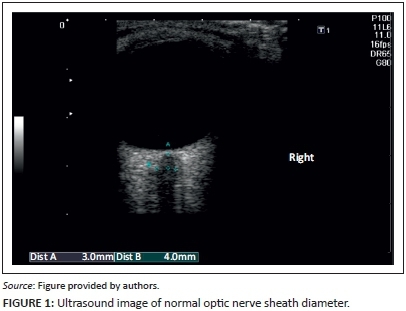 BACKGROUND: It has been well documented that ultrasound measurement of the optic nerve sheath diameter performed by an experienced operator shows good correlation with raised intracranial pressure, irrespective of the cause. METHOD: A prospective analytical cross-sectional study was conducted. All patients ≥18 years of age who presented at our medical casualty and emergency departments with suspected meningitis were enrolled in the study. All patients were evaluated with the use of optic nerve sheath diameter ultrasound with or without computed tomography brain scan prior to lumbar puncture. Lumbar puncture opening pressure measurements were compared with the ultrasound measurements. RESULTS: A total of 73 patients were enrolled in the study, of whom 14 had raised intracranial pressure. The study had a sensitivity of 50% (95% confidence interval (CI) 26.8%-73.2%) and specificity of 89.8% (95% CI 79.5%-95.3%) with a positive predictive value of 54.8% (95% CI 29.1%-76.8%) and negative predictive value of 88.3% (95% CI 77.8%-94.2%). The likelihood ratio of a positive test was 4.92 (95% CI 1.95-11.89) and that of a negative test 0.56 (95% CI 0.29-0.83). Cohen's kappa value was 0.41 which indicates a moderate agreement. 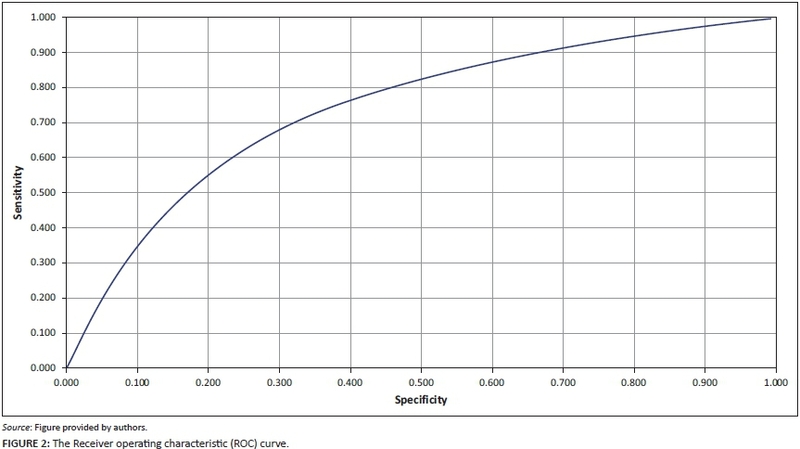 The receiver operating characteristic (ROC) curve had an area under the curve (AUC) of 0.73 (95% CI 0.51-0.95. CONCLUSION: Ultrasound measurement of the optic nerve sheath diameter can be used to exclude raised intracranial pressure, even in the hands of inexperienced operators. Focal and systemic pathology such as tumours, metastasis, haemorrhage, Grave's disease and pseudotumour, however, may render false positive results.4 Bäuerle et al.12 found no correlation between ONSD and gender, age (only patients ≥18 years included) and body mass index to provide a single cut-off value for all patients. Rajajee et al.1 found ultrasound measurement of the ONSD to be an accurate, easy, non-invasive and cost-effective screening method to predict raised ICP in experienced hands. There are, however, a few unanswered questions. Hansen et al.13 reported that ONSD reversibility might be impaired after episodes of prolonged intracranial hypertension, specifically with pressures exceeding 45 mmHg.This finding was confirmed by Rajajee et al.8 who found that the specificity and positive predictive value of ONSD for ICP >20 mmHg are substantially decreased in patients with acute fluctuating ICP between high and normal, which could lead to false positive real-time values. In summary, previous studies found that a value < 4.8 mm was normal and in one study a value >5.9 mm was abnormal in predicting ICP >20 mmHg.1,9 Values between 4.8 mm and 5.8 mm are seen as equivocal. Rajajee et al.1identified the most accurate values; for the purpose of our study, 4.8 mm was used as the cut-off value. The Kimberley Hospital Complex in Northern Cape Province, South Africa, treats a high number of suspected meningitis patients with either focal neurological signs or decreased consciousness and subsequent requests for computed tomography (CT) brain scans to assess the safety of lumbar puncture (LP) prior to the procedure. Being the only tertiary facility in Northern Cape Province, we are burdened with large patient numbers and the specific problem of patients having to travel long distances to reach our facility. The aim of our study was to establish the accuracy of ultrasound ONSD performed by inexperienced operators to exclude raised ICP. In the event of a positive outcome, this technique can be used to exclude raised ICP in all patients presenting at emergency and casualty departments with decreased consciousness or signs suggestive of raised ICP. This approach would especially benefit doctors in peripheral hospitals with limited resources to establish the urgency of treatment and referral of patients. We conducted a prospective analytical cross-sectional study. Approval was obtained from the Ethics Committees of the Faculty of Health Sciences of the University of the Free State and the Department of Health of the Northern Cape. Informed consent was obtained either from the patient or a family member. Data were collected during March-April and November-December 2013. Patients ≥18 years old who presented at the Kimberley Hospital Complex emergency and medical casualty departments with clinically suspected meningitis, and who received a LP with opening pressures, were included in the study. Patients with contra-indications for LP including thrombocytopaenia or other bleeding diathesis and suspected spinal epidural abscess, any orbital and/or globe injury or pathology, and patients with failed and/or incorrect technique of LP, were excluded from the study. ONSD measurements were performed by a total of 11 radiology medical officers and registrars, all familiar with routine ultrasound procedures, but with no previous exposure to this specific technique. A 30-minute didactic session explaining the basic anatomy and technique was followed by a small pilot study which took approximately one hour, giving each operator the opportunity to practise on at least five healthy volunteers. All patients enrolled in the study were evaluated by ultrasound of the ONSD with or without CT of the brain (based on departmental protocol) prior to LP. Following the ultrasound examination, patients had a LP if there were no contra-indication(s) detected clinically or on CT findings. When performed, CT scans were evaluated for predetermined signs of raised ICP, including midline shift, size and shape of the ventricles, status of the basal cisterns and effacement of the sulci. All CT scans were performed and evaluated after completion of the ONSD ultrasound to prevent bias, as the ultrasound study and the CT report were performed by the same investigator. All CT scans were reviewed by a single radiologist; amendments were made if necessary. Ultrasound and CT findings (when available) were compared with LP opening pressures. Results were also compared with previously published results to assess the accuracy of this technique when performed by inexperienced operators. All ONSD measurements were made using a GE Healthcare LOGIQ S8 ultrasound machine with a 9 MHz linear array probe with settings on small parts, field reduced to 4 cm and the optic nerve not zoomed. Doppler measurements were not performed owing to the theoretical risk of retinal detachment. The ultrasound technique used in this study was the technique described by Rajajee et al.1 The examination was performed with the patient in the supine position and the head elevated 20°-30° to the horizontal. The probe was placed on the lateral aspect of the closed upper eyelid; care was taken not to apply pressure on the globe. The probe was angled medially and caudally until the hypoechoic optic nerve could be clearly demonstrated posterior to the globe. Care was taken in distinguishing the margins of the optic nerve sheath from the retrobulbar linear hypoechoic artifact. The ONSD was measured 3 mm behind the retina (Figure 1). Two axial measurements for each eye were recorded, and a mean value for the four measurements was recorded for each patient. To minimise bias, none of the ultrasound operators was informed about the assumed normal cut-off value and no conclusions were made based on ultrasound measurements, as this would not have altered patient management during the study. Lumbar punctures were performed by medical casualty and emergency department registrars and medical officers. Opening pressures were recorded with the patient lying in either the left or right decubitus positions and the legs straightened at the time of the pressure measurement. The zero level of the manometer was adjusted to approximate the level of the left atrium, which corresponds to the position of the spinal canal in the left decubitus position. Patients were also urged to relax to avoid false elevation of the opening pressure owing to the Valsalva effect. As the study from Rajajee et al.1 used invasive intracranial pressure monitoring and mmHg as the unit of measurement, we had to convert mmHg to cmH2O. Using standard international conversion tables (1 mmHg:1.36 cmH2O), an opening pressure >27 cmH2O was therefore considered as raised ICP. The cerebrospinal fluid (CSF) laboratory results and whether the patient received empiric antibiotics were also recorded. The medical officers performing the LP and the ultrasound operators were blinded to each other's results. Descriptive statistics, namely frequencies and percentages for categorical data and medians and percentiles for continuous data, were calculated. The sensitivity, specificity, positive and negative predictive values, likelihood ratios, area under the curve (AUC) and Cohen's kappa value with their respective 95% confidence interval (CI) were calculated for the ultrasound measurements. A total of 102 patients were evaluated with ultrasound of the ONSD with or without CT scan. Of these, 29 patients were excluded owing to missing data forms (23 patients), failed LP (2 patients) and incorrect LP technique (4 patients). No patients were excluded owing to orbital/globe trauma or pathology or a contra-indication to LP. Of the 73 enrolled patients, 59 (80.8%) patients had LP opening pressures ≤27 cmH2O and 14 (19.1%) patients had LP opening pressures >27 cmH2O. Ultrasound measurements <4.8 mm were recorded in 60 (82.2%) patients and ≥4.8 mm in 13 (17.8%) patients. These measurements resulted in true negative findings in 53 (72.6%) patients, true positive findings in 7 (9.6%), false negative findings in 7 (9.6%) and false positive findings in 6 (8.2%) patients (Table 1). Sensitivity of 50% (95% CI 26.8%-73.2%) and specificity of 89.8% (95% CI 79.5%-95.3%) were achieved. A resulting positive predictive value of 54.8% (95% CI 29.1%-76.8%) and negative predictive value of 88.3% (95% CI 77.8%-94.2%) were demonstrated. The likelihood ratio of a positive test was 4.92 (95% CI 1.95-11.89) and the likelihood ratio of a negative test was 0.56 (95% CI 0.29-0.83). Cohen's kappa value for symmetric agreement between ONSD and LP opening pressure was 0.41 (95% CI 0.14-0.67), which indicates moderate agreement (Figure 2). The ROC curve had an AUC of 0.73 (95% CI 0.51-0.95). The CI for AUC overlaps with the results of Rajajee et al.1, therefore suggesting similar results. Of the 14 patients with raised ICP, 13 (92.9%) had CSF laboratory results consistent with either viral, bacterial, tuberculous or cryptococcal meningitis or combinations of these. A total of 28 (38.4%) patients also had a CT brain scan after the ultrasound ONSD measurements were recorded. Of the 14 patients with raised ICP, 5 (35.7%) had CT scans, of which 3 (60.0%) scans revealed signs suggestive of raised ICP. One patient had an ultrasound measurement ≥4.8 mm with features of raised ICP on CT and had a CSF laboratory result consistent with viral meningitis. The LP opening pressure, however, measured only 9 cmH2O. Another patient had an ultrasound measurement <4.8 mm and a normal CSF laboratory result with a LP opening pressure >27 cmH2O. To our knowledge, the present study is the first to assess the accuracy of ONSD ultrasound performed by inexperienced operators in the specific setting of suspected meningitis. Previous studies have shown that this technique is accurate in predicting raised ICP irrespective of the cause.1,2,3,4,5,6 In theory, this approach then provides the emergency care physician (especially in peripheral hospitals with limited recourses) with a cost-effective, accessible and simple way to exclude raised ICP owing to primary causes ranging from head trauma to a primary brain tumour, and to establish the urgency of management and/or referral of the patient. The sensitivity and specificity were lower than those reported by Rajajee et al.1 but not significantly, as the AUC tested similar and confidence intervals overlapped. Secondly, previous studies were mostly done on ventilated and sedated patients in an intensive care unit setting and ICP measured by intracranial monitors. These patients, for obvious reasons, were substantially more 'co-operative' than our patient population. Some of our patients were confused and restless, leading to them moving their heads and, even when their heads were still, moved their eyes. Accurate measurement of the ONSD was consequently very difficult and in some cases nearly impossible. We have to assume that poor co-operation of this small group of patients might have contributed to less accurate measurements which ultimately might have led to an underestimation of the operator's true ability to accurately measure the ultrasound ONSD. It was, however, not possible to quantify this assumption. A further limitation of our study was the small number of patients with raised ICP. Potgieter et al.14, however, used only normal volunteers as test subjects and concluded that the technique was accurately performed by novice operators. We were unable to establish inter-observer variability owing to the large number of operators and the small number of patients with raised ICP. Another limitation was the LP opening pressure measurements. We are aware that invasive ICP monitors are considered the gold standard for measuring ICP.9,14 Our study would not have been possible without using LP opening pressure measurements which, although fairly accurate, still have shortcomings. This was demonstrated with the two patients referred to in the last paragraph of the results. We have to assume possible LP opening pressure measurement errors in these two scenarios. It is unlikely to have a normal LP opening pressure with signs of raised ICP on CT, abnormal ultrasound ONSD measurements and CSF laboratory results consistent with viral meningitis. It is also unlikely to have normal CSF laboratory results and ultrasound ONSD measurements with raised LP opening pressures. This resulted in an inaccurate false positive finding with the first patient and an inaccurate false negative result with the second patient (not adjusted as such in the final results). We could correlate all findings in the remainder of the patients and can assume that the other opening pressure measurements were accurate. When available, we also compared CT findings with ultrasound measurements and LP opening pressures. There is currently no accurate method to estimate ICP based on CT findings alone; however, a linear but non-predictive relationship has been described between baseline ICP and initial CT brain findings.9 This factor, however, was not our main aim and did not alter our results. Whilst the study did not demonstrate an acceptable positive predictive value, ONSD ultrasound had a high negative predictive value, even in inexperienced hands. A moderate agreement between ultrasound operators was also demonstrated and similar results to Rajajee et al.1 were found. We thank Dr Daleen Struwig, medical writer, Faculty of Health Sciences, University of the Free State, for technical and editorial preparation of the manuscript. G.d.T. (University of the Free State) was involved in planning and writing the study protocol and obtaining ethics approval, presented the didactic session, and performed some of the ultrasound procedures, data collection, compilation of results and writing of the manuscript; D.H. (Kimberley Hospital Complex) was involved in planning the study protocol and contributed to the final manuscript; M.N. (University of the Free State) performed the statistical analysis of data and contributed to the final manuscript.